Ronald Reagan Washington National Airport as it was on opening in 1941, long before Reagan's name had been added. The facade of historic Terminal A looks today much as it does then, a monument to a bygone era when air travel was a more glamorous affair of fancy hats and suits. DCA was listed on the National Register of Historic Places in 1997. Ronald Reagan Washington National Airport - better known to long-time locals simply as "National Airport" or "National" - celebrated 75 years this week since its opening on June 16, 1941. We've been thrilled by this not just because National (IATA code "DCA") is quite literally in our backyard (we watch planes land from our dining room), but also because we're proud of the outstanding airport we have right here at home in Arlington, VA. Its unique blend of prime location, efficiency, beauty, and history is truly something of which Washingtonians and Arlingtonians should be proud. National Airport is unique for its close geographical proximity to the Washington, DC city center. 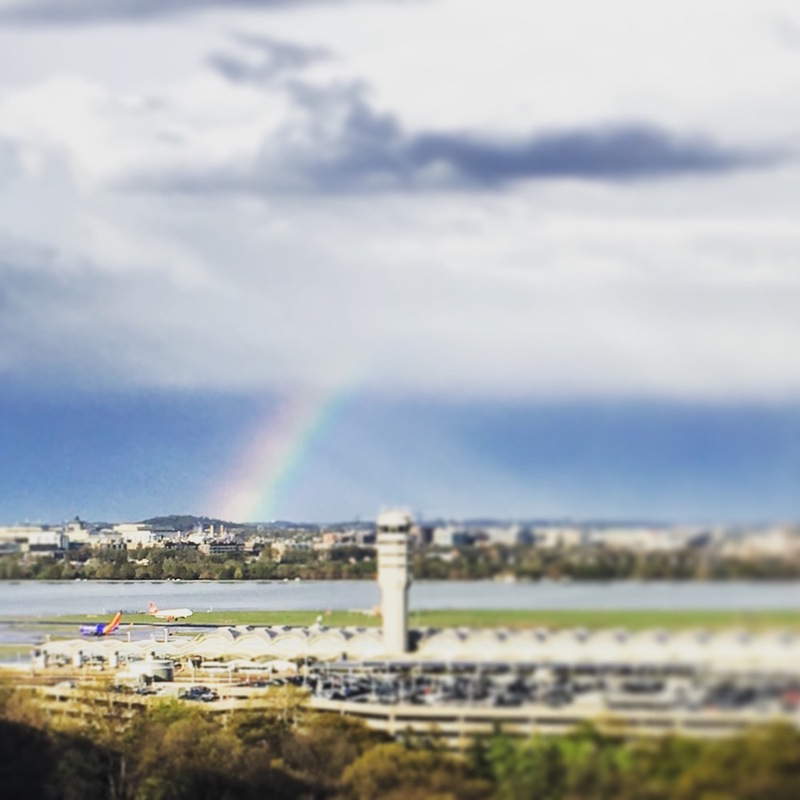 It's technically located in Arlington, across the Potomac River from Washington proper, but is nonetheless closer to the downtown of both than most airports are to their respective cores. While Chicago's O'Hare and Midway Airports are sixteen and seven stops from the city center, and New York's JFK, Newark, and LaGuardia Airports aren't even technically connected by subway, the Washington National Airport Metro station is but four stops from the city center. In our estimation, only Boston Logan Airport comes close to National in terms of downtown proximity, but unlike National, its subway station is a bus ride away from the main terminals. Further, DCA works a throughput of over 21 million passengers per year using 45 gates, or just over 471,000 passengers per gate per year. 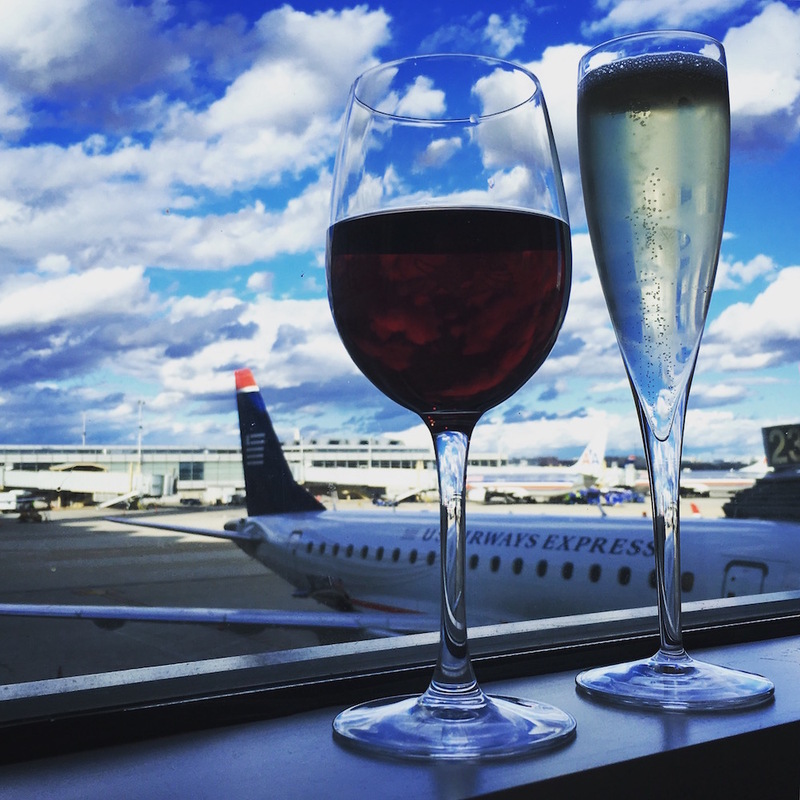 By contrast, Dulles International Airport, one of the Washington area's other two airports, is serving slightly fewer passengers per year through 123 gates. Atlanta's Hartsfield-Jackson International Airport (the world's busiest, a true marvel of engineering) serves over 101 million passengers through 207 gates, or about 487,922 passengers per gate per year. Washington National Airport is insanely efficient both in terms of geographic accessibility and overall throughput. An American Airlines hub, National is also insanely beautiful. The original 1941 terminal, now called Terminal A, was augmented in the late 1990s by Terminals B and C designed by architect César Pelli (of Petronas Towers fame, with which you can see immediate stylistic similarities in the "new" National terminals built around the same time). Terminal A today exists in the form of the historic lobby and gates 1-9, the "Banjo" owing to the rotunda around which the gates are clustered that is connected to the ticketing area via a long hallway. Look it up on satellite; it looks like a banjo, we promise. These southernmost gates primarily house Southwest, but are also home to Air Canada, Sun Country, and Frontier airlines. An adjacent "pier" here was torn down when the new terminals were constructed; its outline is still visible in a Google Maps satellite view, and we suspect the airport wishes they could get those gates back to accommodate the ever-busier hub that National has become (but was never meant to be). The historic facade and lobby are breathtaking sites that take the mind back to a bygone era when air travel was a more glamorous affair of fancy hats and suits. Walking roughly north for what feels like days, you'll pass the beginning of Terminal B where United hangs its hat. Though it trails American, Delta, Southwest, and jetBlue in market share here, we love that United currently flies the airport's largest regularly scheduled planes: Beautiful 757-300 aircraft offering daily service from Washington to Denver and San Francisco! Once past United's bizarre nook and cranny of a gate area, travelers enter the main "National Hall" that connects Terminals B and C, and is the centerpiece of the 1997 renovation housing the American Airlines hub occupying all of Terminal C save for one Virgin America gate, and Terminal B that hosts Delta, jetBlue, and Alaska Airlines in addition to the aforementioned United gates. National Hall itself is directly connected to a Metro (subway) station that routes passengers straight into the airport. It's one of the most convenient public transit situations we've seen at any airport, anywhere, ever. National Airport has been a big part of tying the northeastern United States together. Near-hourly air "shuttle" service has been offered between DCA, New York, and Boston since 1961. This is incredible when you consider that in 1961 these flights were being run on propeller-driven planes at a cost of about $11 a ticket. Today the service is operated by American Airlines as "American Shuttle", having passed from Eastern Airlines through the hands of the financial disaster that was Trump Shuttle (yes, Donald Trump... the failure of a business never turned a profit) to US Airways Shuttle and now to American. Delta offers a competing service, "Delta Shuttle", running hourly between New York and Washington, Boston, and Chicago (it runs only from these cities to New York, not from, say, Chicago to DC). jetBlue, for its part, operates a DC-Boston route that feels almost hourly at some times of the day. The airport is a surprisingly robust dining and shopping option. It actually works for locals (we routinely meet folks there for lunch or dinner even when we're not traveling) because (1) it's so close to the city cores, (2) is directly served by the Metro, and (3) National Hall is "pre-security", meaning that all of its restaurants are accessible to people without a boarding pass before the TSA security line. We recommend Cibo Bistro and Wine Bar or Legal Seafoods, both located about midway through National Hall. We can't say the same for Sam and Harry's near Terminal C, which we have often found to be mediocre. Three piers jut out from National Hall to comprise Terminals B and C. The northern pier is Terminal C, and the southern pier is Terminal B, but the odd middle pier is half Terminal B and half Terminal C despite having no physical demarcation between them. It's therefor best when flying out of B or C to direct yourself by gate number rather than terminal letter. Terminal A is sufficiently self contained to exist in rather its own little world, though one can walk indoors from one to the other. We wish that the four piers (the "banjo" and the three attached to National Hall) had simply been given terminal designations A through D. It may have been easier for the confused traveler, but nobody asked us. On a similar note, each of the piers have their own TSA security line, so it is impossible to connect from one to the other by walking. Travelers connecting form one American Airlines flight to another (or theoretically from American to either jetBlue or Virgin America) can hop a quick bus ride from Terminal C (north pier) to Terminal B/C (middle pier). Otherwise one must exit security and re-enter for their specific gate. This isn't usually an issue as the vast majority of connections made here are from one American flight to the other. The TSA lines are some of the quickest we've seen anywhere, and TSA PreCheck (generally open until 7pm) is a breeze. Beware Gate 35X! National hosts more passengers and flights than it has gate capacity to accommodate. Gate 35X is actually the lower level of American's gate 35 in Terminal C (north pier). While there is absolutely nothing out of the ordinary about Gate 35, Gate 35X involves passengers navigating a chaotic staging area, boarding a bus out to the tarmac, and then actually walking up an outdoor ramp to board their plane. This adventure is limited to flights on rather painfully small "commuter" planes, though in my experience I've seen said small planes bound for everywhere from small Charleston, WV to Jacksonville, FL or Nashville, TN (respectively the nation's twelfth and twenty-fifth largest cities). Take the hint and give yourself a little extra time when you see Gate 35X on your boarding pass. Oh, and bring an umbrella just in case.